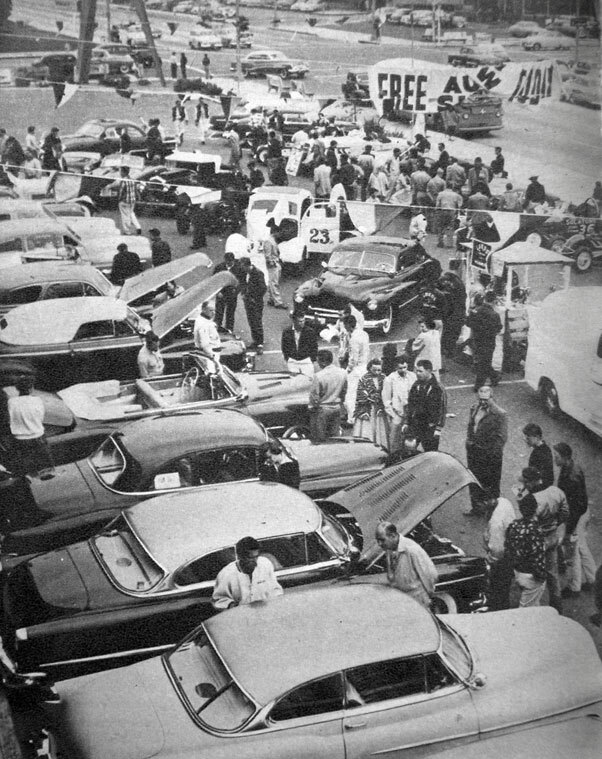 In May 1954 the Lords Car Club organized a free one day outdoor Car Show at the Thrifty Drug Store in Los Angeles. The Customs they gathered for this event was the best of the best. 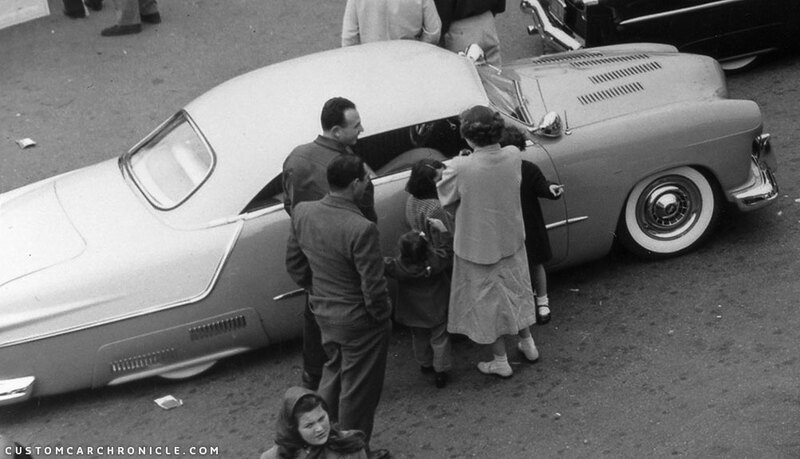 One of the most incredible photos of the Golden Age of Custom cars must be the birds eye view photo taken in 1954 at the Thrifty drug store in Los Angeles. This single photo shows no less than 12 top rate Custom Cars and four more Hot Rods parked together at a free outdoor show. 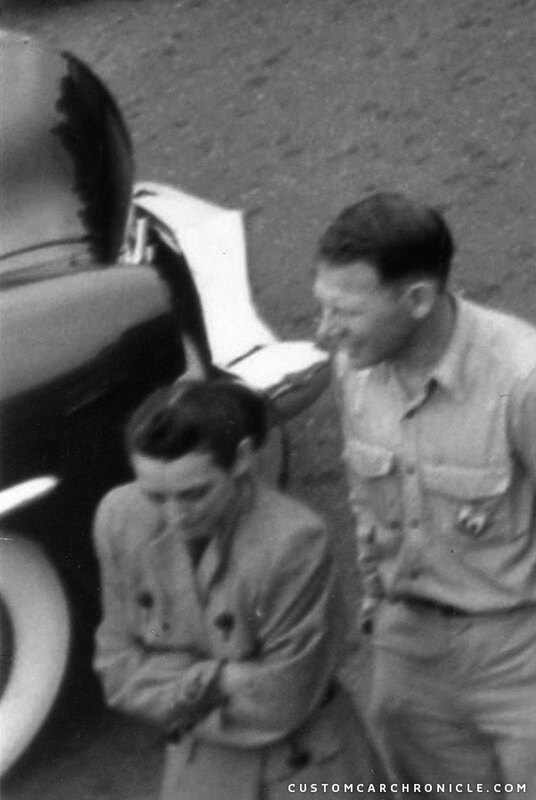 The photo was professionally taken from the roof of the Thrifty drug store on Rodeo Rd and LA Brea on May 14, 1954. All the cars are as good as Crystal clear and sharp, and we are able to see them from an angle we usually don’t see. The first time I saw this photo was in an Hot Rod magazine July 1989, but only very little could be seen because the lay-out artist had covered all the cars with captions and other inset photos. Fortunately for use more people must have noticed the photo and notified the R&C team about this. In the December 1989 issue of R& C they published a nice large black and white print of this amazing photos and identified most of the cars in the photo. Later I came across the same photo on the back cover of the 1955 Custom Cars annual… but there it was also partly covered and rather small. 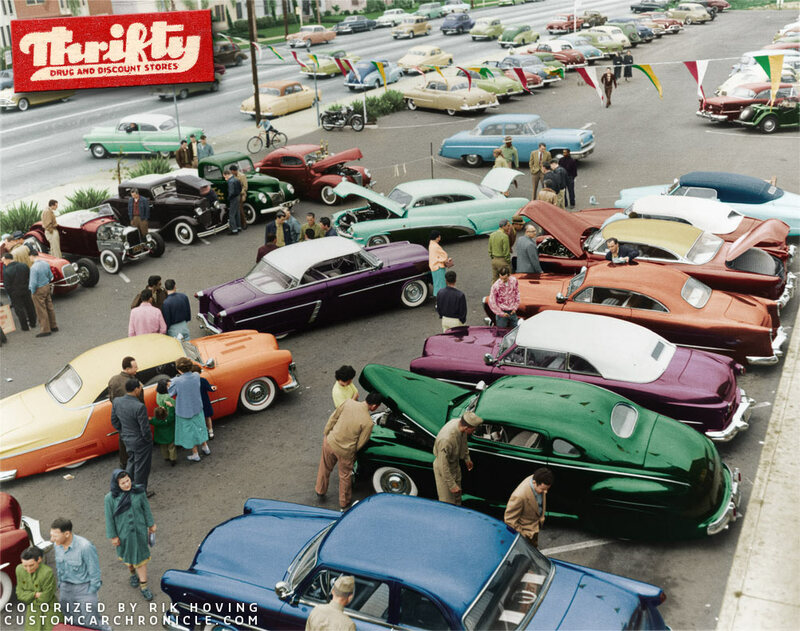 For the Rodder’s Journal #33 I created a series of colorized old black and white photos of Custom Cars, the piece the resistance was this overview photo of the outdoor car show at the Thrifty drug store parking lot in 1954. It took me nearly a month to add all the color to this intense photo. When I started working on a series of colorized photos for the Rodder’s Journal back in 2006 this parking lot photo came to my attention again. How great would it be to see this old black and white photo in color?! I discussed the possibilities with the RJ team, and they provided the high res scan made from the Greg Sharp Collection photo. To be able to see this photo in high res with all the details on my computer screen was a real treat. It took me a while to figure out all the colors on the car and had some help from Greg Sharp and a few other people who remembered the cars from back in the early 1950’s. We do not know much about the show other than the things we can see in the photos and the amazing thing that over the years information was shared that at least two of the trophies give at this show survived. One for the Chuck DeWitt Shoebox by Barris and the other for Jack Stewart’s MG restyled by George Cerny. 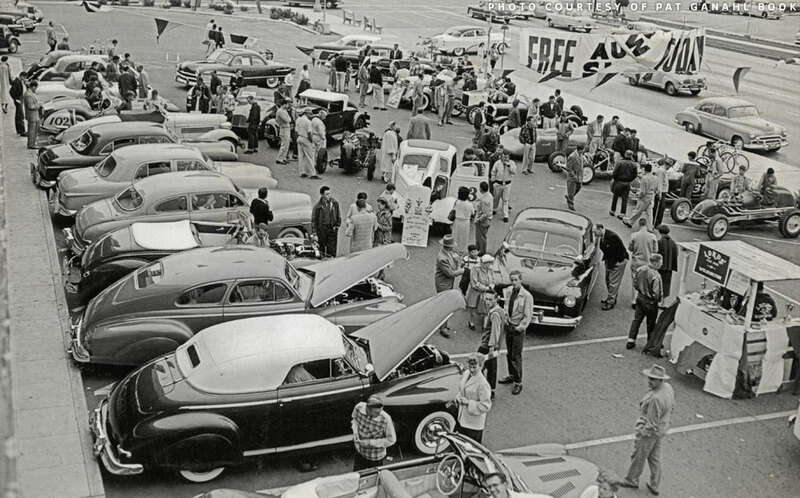 We also know that the Lords Car Club from Wilmington, Ca hosted the show and that the Thrifty Drug Store was the sponsor of this one day free in cooperation with the NHRA show. In our research we have not been able to come up with any kind of advertising or promotional material for this show. But looking at the high quality cars at the show the information for it must have been spread well. 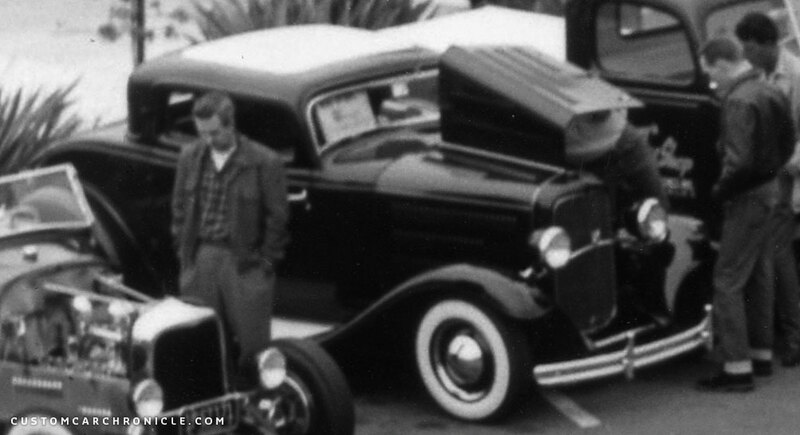 Lets take a closer look at the cars that were at the show with cropped images from the original photo, and with the information we have gathered on the show. Some of the cars are hidden quite a bit by other cars so we used some other photos to show them a little better. 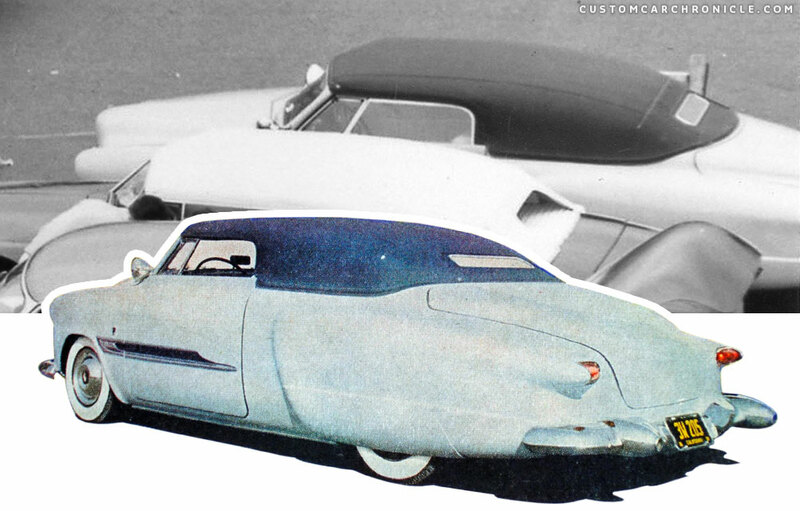 Kaiser bumper over rider and front section of the Louis Bettancourt 1949 Mercury restyled by the Ayala brothers and later redone by Barris. 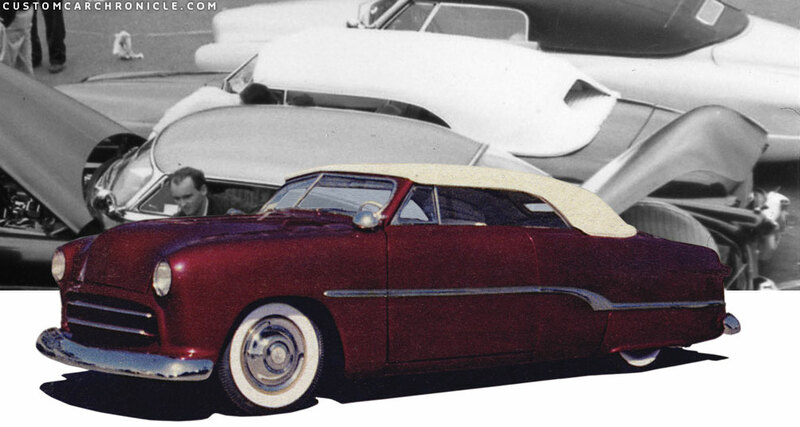 Tommy Thornburgh’s 1947 Studebaker convertible built by Barris. Don Carroll’s 1949 Ford convertible built by Gaylord. 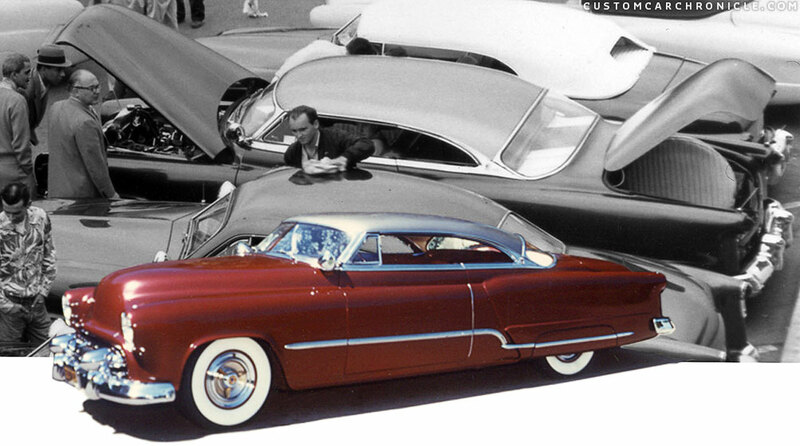 Buster Litton – Don Schaedel Barris Kustoms / Cerny built 1949 Ford “Panoramic Ford”. Click HERE if you want to read more about the Buster Litton Panoramic Ford. The Chuck DeWitt 1959 Ford was awarded with a first place award at the Thrifty parking lot show. We only know this because James Washburn was given a box of trophies by a friend one day. His friend had bought the trophies at a Garage sale in Richmond Ca. for a buck a piece. His friend did not have a use for them, but remembered James asking him that whenever he would come across old car related stuff as trophies etc and the price was right to get them for him. He went over with a box with trophies, James was not home so he left the box on his porch, and he forgot about them. It took James two month to find out who had given them to him. By then his friend could not really answer any of James questions about what else there was at the garage sale. The only thing he did remember was that the garage sale was held by family members who’s grandfather had passed away and the attic was cleaned. Included in the box was at least one other trophy that had the name Chuck DeWitt engraved. 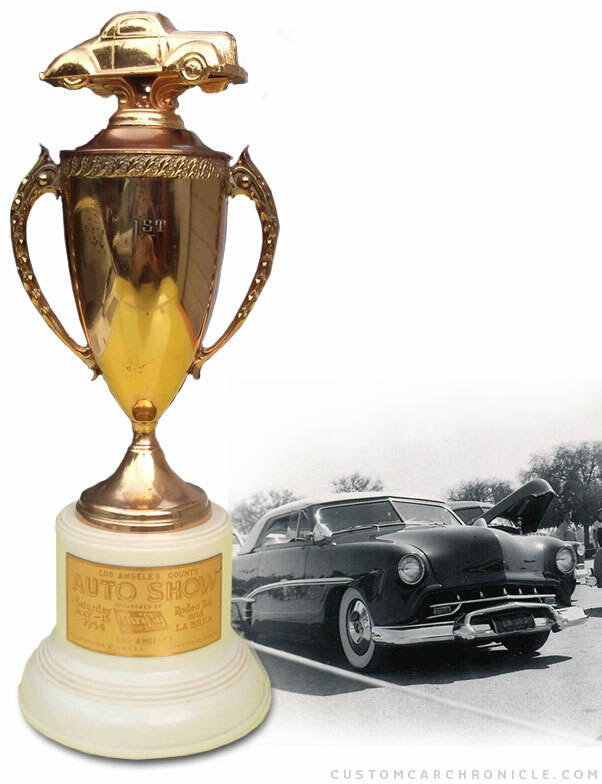 So most likely all the trophies from this garage sale once belonged to Chuck and were the trophies won with his purple Barris Restyled 1950 Ford convertible with padded top. In the box there was also a trophy from this May 1954 Thrifty Drug Store Parking Lot Show… making us believe that Chuck won first place with his Shoebox at this show. We have tried to find out if the grandfather in the garage sale might have been Chuck deWitt, but so far we have been unable to verify this. Or perhaps the car was once sold to a new owner and the trophies went with the car? 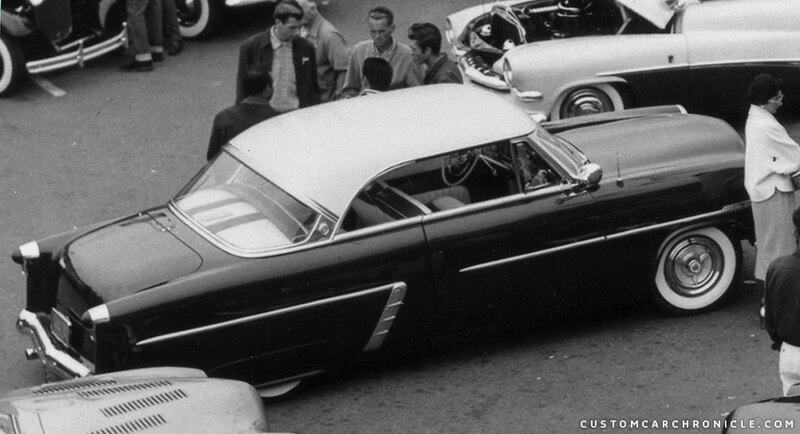 Chuck DeWitt’s 1950 Ford convertible by Barris. 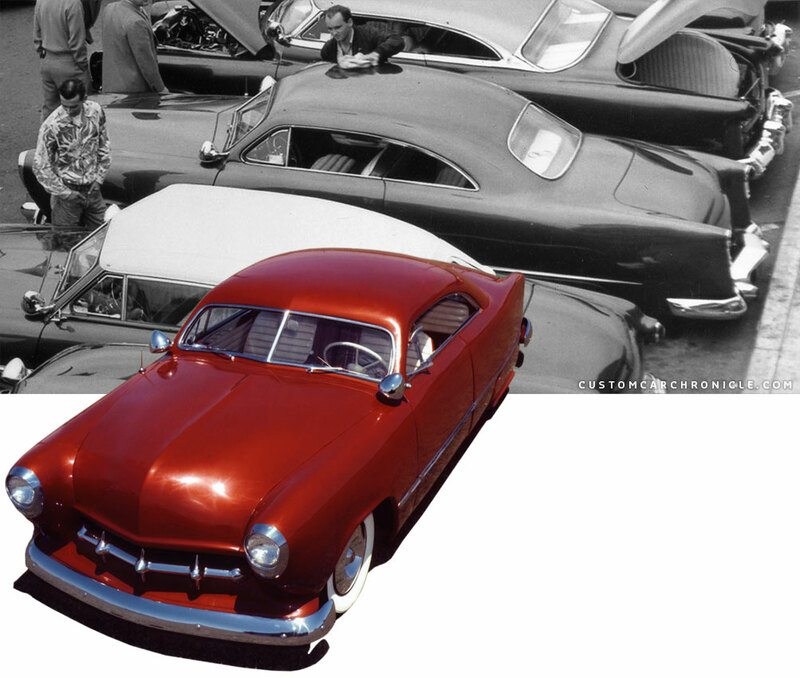 Click HERE if you want to read more on the Jesse Lopez 1941 Ford Coupe. 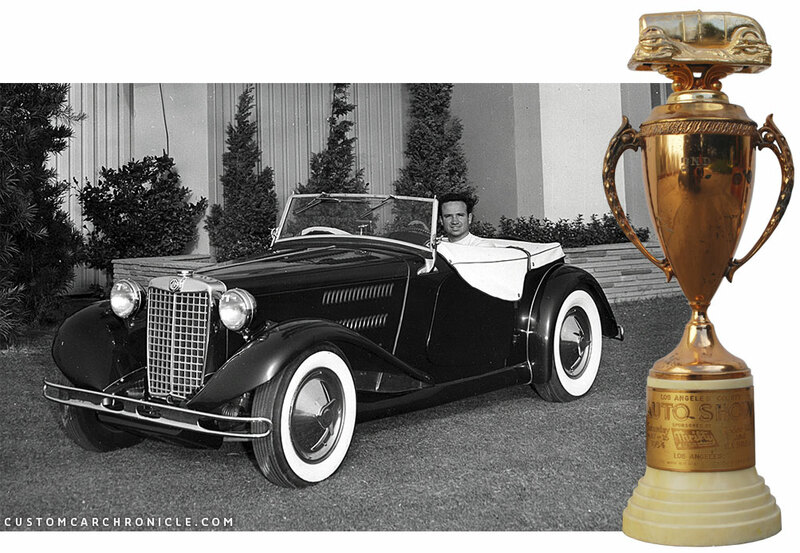 The trophy from James Washburn’s collection and an inset photo of Chuck’s Ford taken at a different outdoor show. Close up of the photo-etched tag on the trophy. 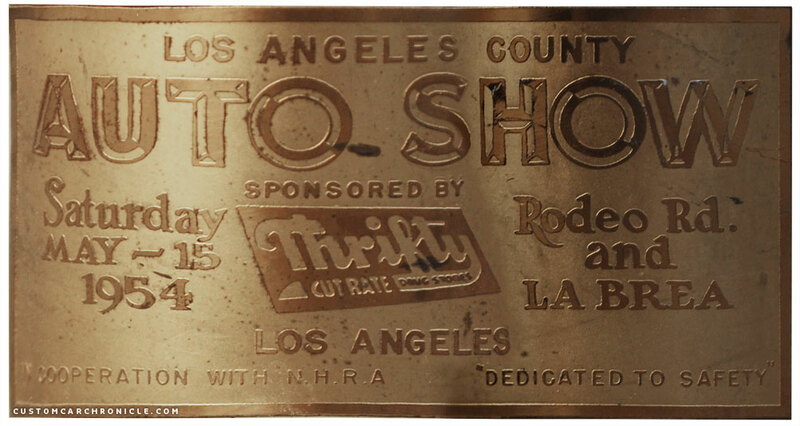 Los Angeles County, Auto Show Saturday May – 15 1954 Sponsored by Thrifty Los Angeles Rodeo Rd. andLA Brea. In Cooperation with NHRA “Dedicated to Sadety”. Jesse Lopez 1941 Ford Coupe created by Jesse and Sam Barris, when this photo was taken the car was owned by Danny Lares. 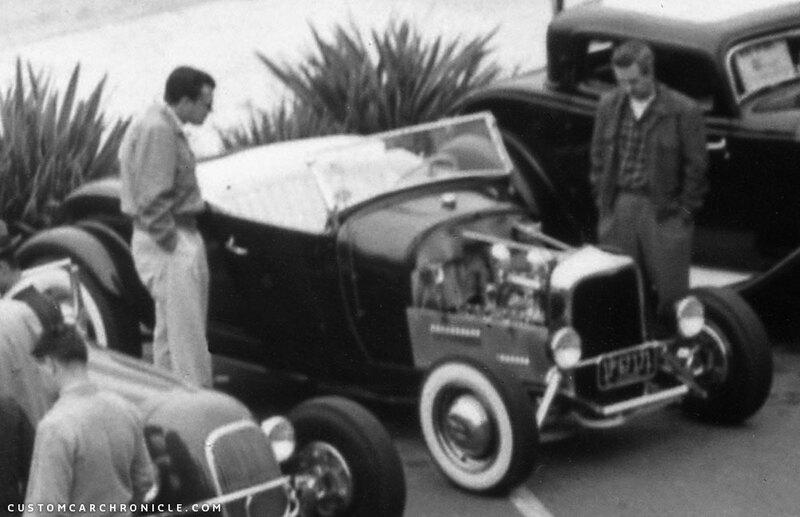 After Danny had bought the car he had Barris add longer pieces of hood side trim and the Barris Crest. The last car in this row is an unidentified mild customized 1953 Ford coupe. 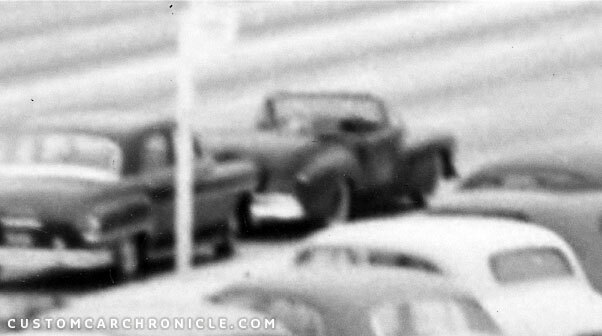 I have colorized it dark blue in the color photo, but I have no idea if that was the cars actual color. All the way on the top of the photo parked at the curb I spotted this unidentified Sports Custom. 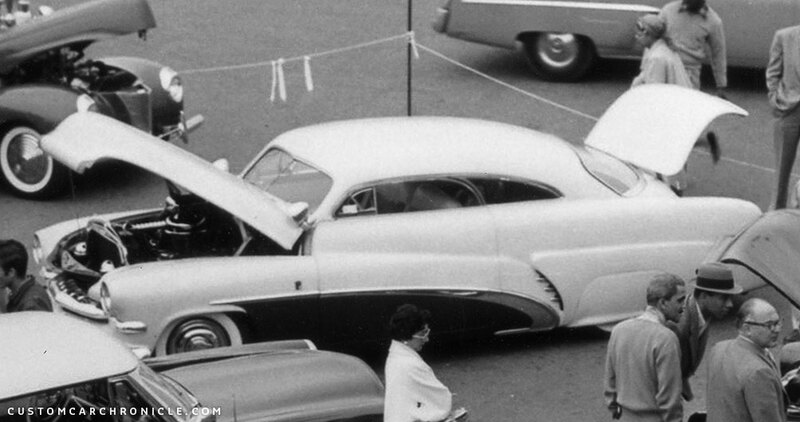 Most of the focus on the Thrifty Drug Store 1954 Parking lot show has always been on the photo taken of the right side of the parking lot. This was the section were all the famous cars were parked. But the photographer also took at least two photo facing the other side of the parking lot at the event. And this allows us to see that the show was held at most of the side section on the Rodeo side of the complex. This photo also shows that the Lords of Wilmington Car Club, who hosted the car show, had a small booth set up in the center of the event section of the lot. This section of the parking lot has the “less famous” cars on display. Although there is a nice, unidentified, early 1940’s Chevy convertible with chopped padded top and a Barris Custom Merc on that side. 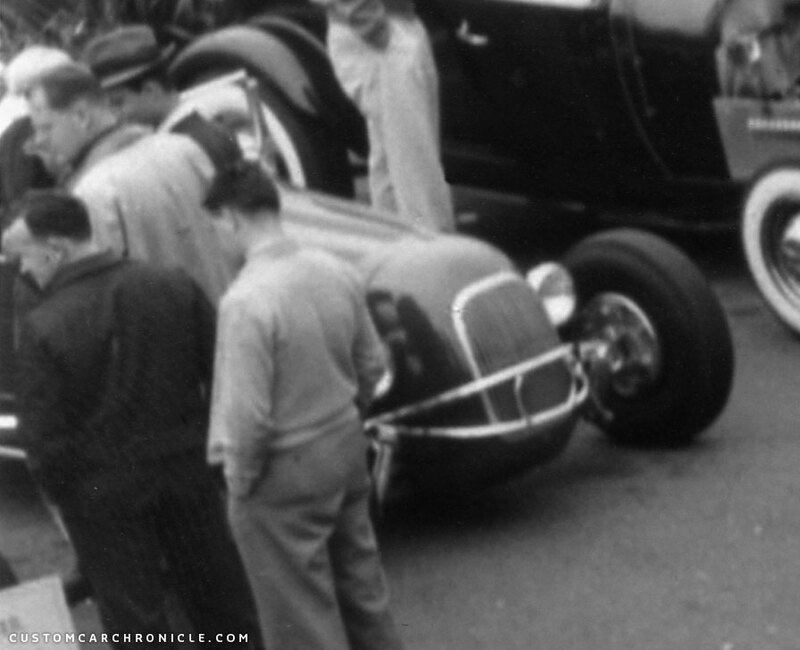 Also the Shadoff Special Streamliner can be seen under the “Free” sign, the Drifters 1935 Ford with open hood and open drivers door in the middle of the photo. The first photo from the “other side” was most likely taken earlier on the day. At least one car that we can see in the other photo is missing, and it also seems to be a little less crowded. This photo looks to be taken a little later on the day. 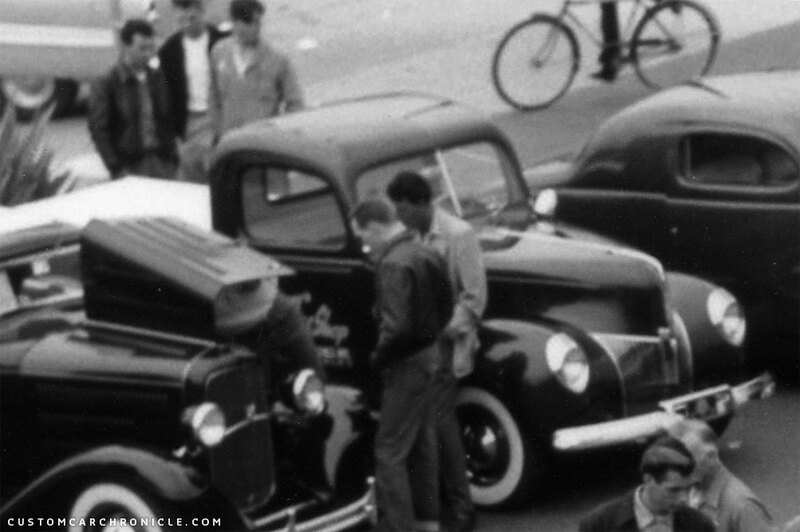 Some more people are looking at the cars and what is very interesting is the lower section of the Shrifty sign on the top left part of the photo. 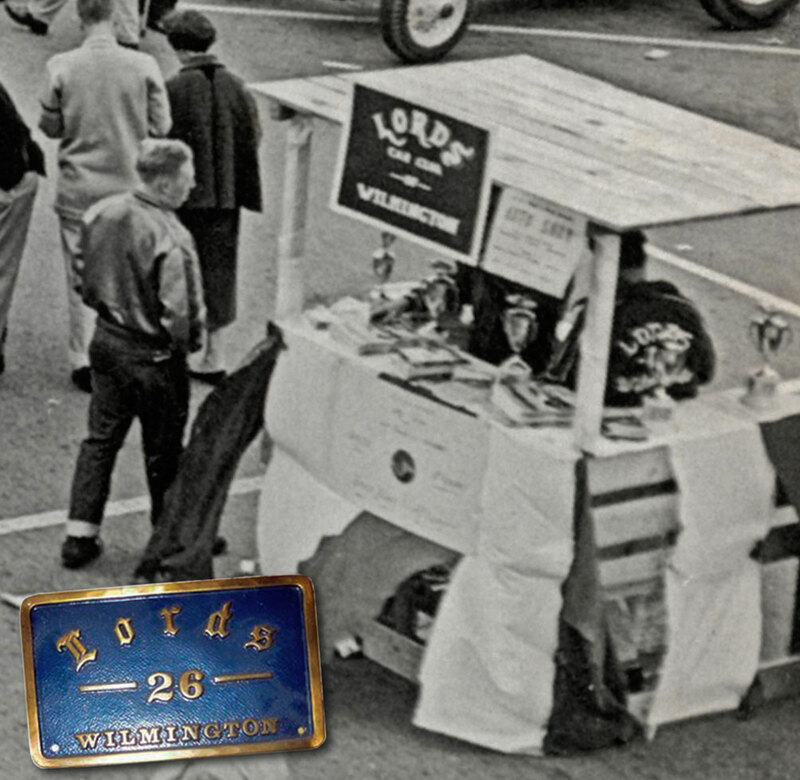 The Dark colored Mercury in the center of the photo next to the Lords club booth appears to be Dale Marchall’s 1950 Mercury restyled by the Barris Shop. Dale Marshall 1950 Mercury by Barris Kustoms. 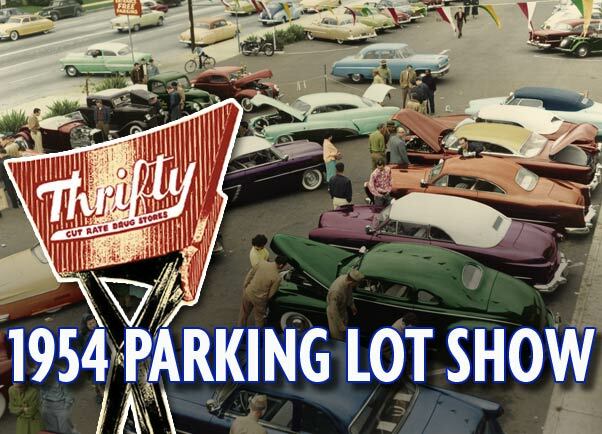 The Lords Car Club of Wilmington, Ca hosted the event which was sponsored by the Thrifty Drug Store. In this photo of the booth we can see several of the trophies to be given away at the end of the event, and some kind of magazines, or perhaps flyers. Sadly the two part banner is flipped over half way. But we think that the banner said “Free Auto Show Today”. When I visited Jack Stewart together with my friend Palle Johansen on the Jack Stewart Research trip in 2010 I photographed some of the trophies he still had from his 1941 Ford, his MG and his 32 Ford. 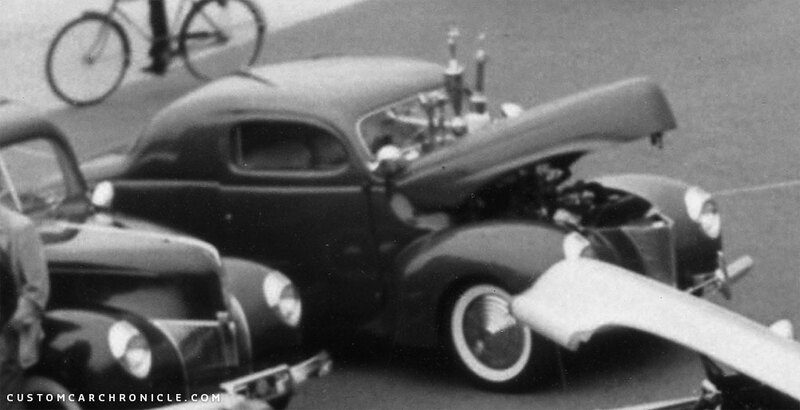 Some of the trophies that belonged to his 1941 Ford were photographed in details, but the others not. 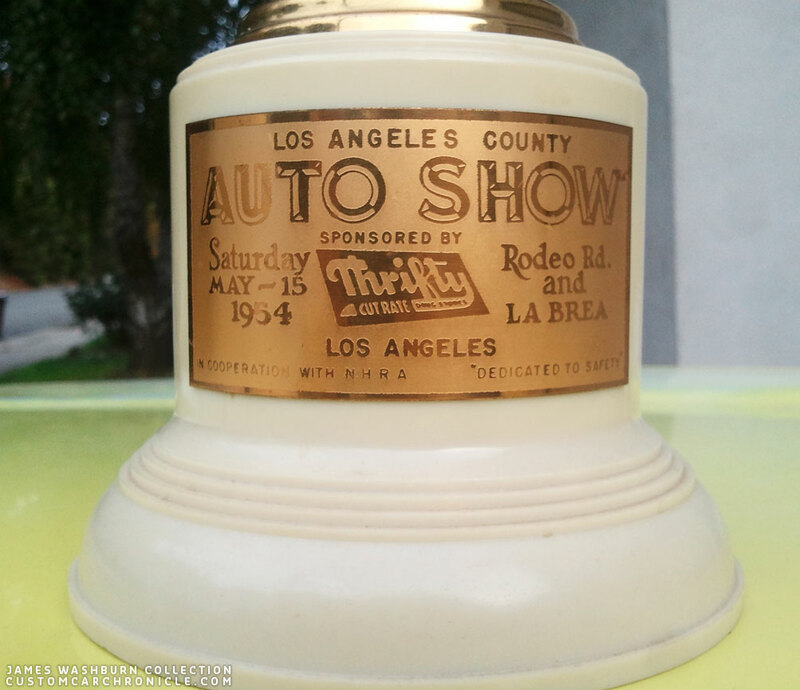 Later when I wrote the Jack Stewart Ford book and wen I looked over the photos a bit better I noticed that one of the trophies that I did not shot in detail was from the Thrifty Car show. I recognized it from the Chuck DeWitt trophies. When we visited Jack for the last time in 2013 I asked him about the trophy and if it was perhaps from the MG. Jack could not really remember much from the show, but when I told him a little about the Thrifty parking lot Show he mentioned that he must have been there with the MG. The trophy is engraphed with “2nd”, but Sadly he could not remember anything else about it. Non of the photos taken at the event show Jack’s MG, although there are two MG’s visible in the “other side” photos, and a section in between the two photos is not covered in any of the photos. Jack’s MG custom restyled by George Cerny and the trophy Jack had saved all these years. Click HERE if you want to read more about the Jack Stewart MG. I digitally stretched the etched tag from Jack Stewart’s trophy to give us a better look at it. The location of the Thrifty store where the Car Show was held in May 1954. This image from Google maps shows that the corner of Rodeo Drive and LA Brea is still a shopping area. 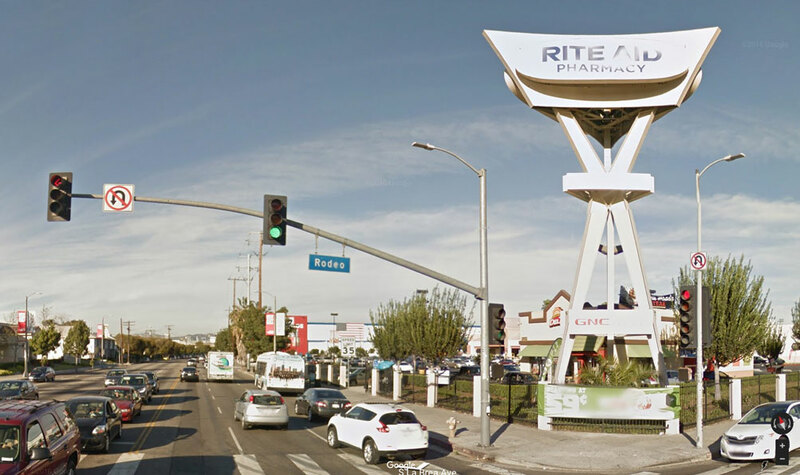 At the former Thrifty drugstore there now is a Rite Aid Pharmacy. 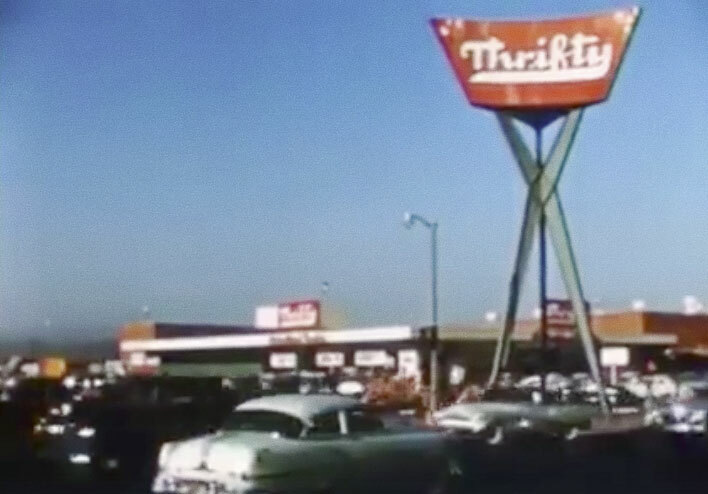 But the Thrifty sign structure on the corner is still there today. There are many amazing things about this one day free outdoor car show. The few photos that have surfaced of the show, the fact that two of the unknown number of trophies given out survived. And above all the amount of high-end Custom Cars gathered for this event. Can you imagine how it must have looked when the show was started, or even better ended, when all these amazing custom cars were started and driven from the lot, to cruise the LA streets on the way home. That must have been one amazing sight. 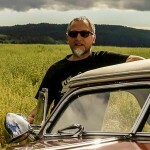 Here’s to Rik, our photo-archaeologist! You open up windows; give us visions of the past. And inspiration to keep it all alive. Cheers. Rik, another very well put together article. I really like how you added a picture of each car over the show pictures so everyone can get a better idea of the overall look of each car- clever. I still have the larger version of the picture I got from you in Sacramento during the Merc Gathering that shows the unidentified sports custom parked in the street. 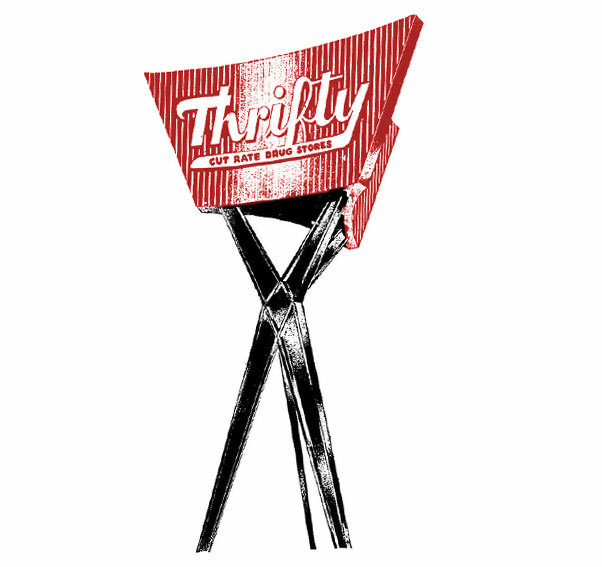 It’s fascinating to see the Thrifty sign is still there today. 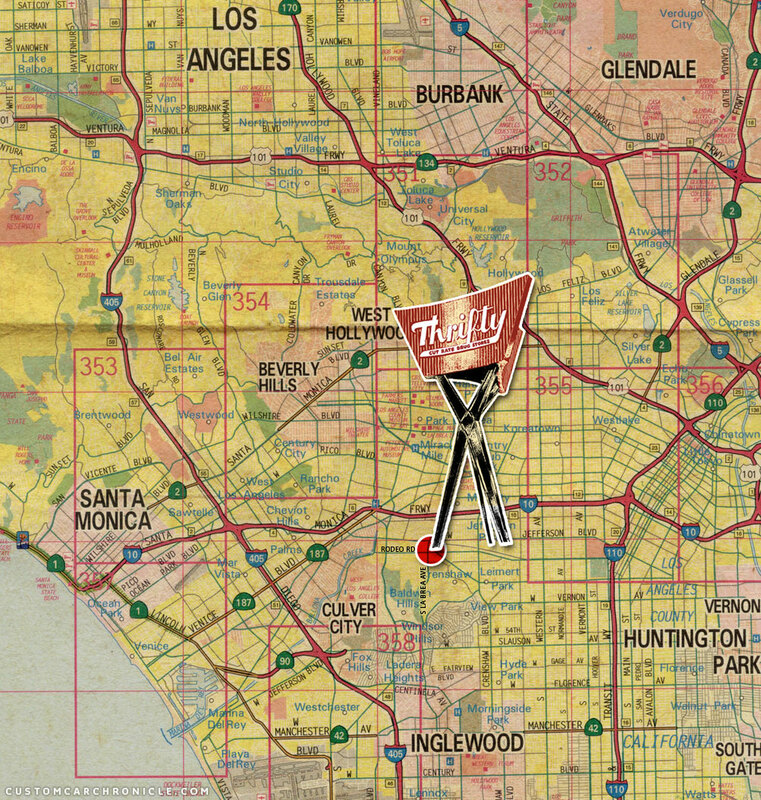 As most people from Southern California know, all of the Thrifty stores became Rite-Aids and they still have the best Thrifty ice cream counters inside…hard to beat that ice cream on a summer day. It almost looks like the Del Taco in the new picture of the street corner is where the original Thrifty building stood- perhaps the Rite-Aid is in a larger building in the same shopping center now? Man, I would give my left nut for that Chuck DeWitt trophy…what a find!!! Oh, as you probably know, that is Don Schaedel wiping the rood of the Panoramic Ford. Man, I could stare at the top on the Chuck DeWitt Ford for hours…I really think that is a perfect top- the overall shape, side window openings…everything about it is spot on. Very interesting article Rik. Any idea about the 49-51 Ford at the top middle of the “other side” picture? The proportions look like it might be sectioned. I have not been able to identify the Shoebox Ian. But I do not think it is sectioned. It has 51 taillights and distance between the taillights and the side trim looks to be identical to that on a stock body. As others have said. Another great article Rik. I always appreciate your attention to details. As a Kid growing up in Rusty Detroit this is the way I pictured the sunny land of make believe, California. Oh to have a time machine……..
Great feature Rik, real nice. We discussed this back when the hamb was fun years ago but you took went deeper in this article. This real good custom material. As Torchie said “This is the way I pictured the sunny land of make believe, California”. Your “way-back machine” is in great working order..! I love this type of pic and story from the glory years of customizing. What a gathering! p.s. I have that image in the shop and marvel at it regularly.